Pavel Rodkin - Having irrationally ruptured relations with the Russian world, Ukraine is moving toward its end. The negative identity of the anti-Russian world, expressed in the form of mass hysteria, was imposed on and accepted by society. It has become one of the reasons for this disaster. The United States is actively using negative identity as an instrument of modern geopolitics. Can modern Russia counter this humanitarian and communication weapon, considering that it was the USSR that fully experienced its destructive impact for the first time? The technology of introducing negative identity into the public consciousness was used against the USSR and became one of the most effective instruments of destroying the enemy from within. Soviet and later Russian society failed to understand what was happening, because this brainwashing was so powerful, and at the same time, inconspicuous. It is only now that this technology has been so vividly revealed by the events in Ukraine, thereby exerting a sobering-up effect on Russian society and part of the elite. Negative identity means that society (both individuals and en masse) have self-critically renounced their own culture, history, social and government system under the influence of outside forces. Negative identity forms a specific, uncritical perception of the world and a positive image of external forces, as well as an illusion of affiliation with them. Opposition to one's own society is being developed through social (class), cultural, religious, national and ethnic conflicts, that are being aggravated or created artificially via mass negative identification. As a result, the victim becomes a voluntary and the most loyal assistant of its own murderer. Negative identity is a virus-based technology of internal self-destruction of society and, as a consequence, of the state, which is being developed in the sphere of mentality, as defined by Alexander Zinoviev. The development, accumulation and introduction of a certain system of values in the public consciousness in the sphere of mentality is followed by the involvement of the public in certain actions based on their ideas. The sphere of mentality is shaping the public attitude to political and social processes, and determines their action or inaction under certain circumstances. As a result of society's sophistication and the subsequent spasmodic development of network technology, the state was no longer capable of keeping the sphere of mentality hermetically sealed, and lost control over it. In the last Soviet years, negative identity was manifested in the rejection, derision and disbelief of ideology, as well as national values and symbols. This meant that the victory of the anti-Soviet world was preordained. But the victorious anti-Soviet world instantly turned into the anti-Russian world. "Communism was the target but Russia got the bullet," as Zinoviev put it. The formation of the anti-Russian world has been taking place for years in the post-Soviet space, primarily in the sphere of mentality rather than geography. Although the anti-Russian world was being built in the entire post-Soviet space, this project was fully implemented via negative identity in Ukraine. The conflict between Ukrainians and Russians is absurd and unthinkable from the perspective of the Russian world. Although initially Ukrainian identity was anti-Russian, artificial and surrogate (in fact it was the project of Austria-Hungary and Germany in the early 20th century), it received new positive development in the USSR. The Soviet and Russian world accepted Ukraine and made it part of the country. Russia, no matter whether it exists as an empire or a federation, has no problem with integrating the most diverse ethnicities, nationalities, cultures and religions. Contemporary Ukraine sincerely believes it is part of Europe and the abstract West primarily mentally rather than geographically or attributively. The naïve faith in "Euro Communism" that has penetrated Ukrainian society is irrational and uncritical, and is fueled by a radical setoff against Russia, even if this is done with the help of human trash like WWII Nazi punitives. Ukraine's current identity is both infantile and aggressive. As a result, Ukrainian society is irrevocably losing the ability for realistic analysis of the situation. The problem is that no matter how powerful the virtual Ukrainian identity and its puppet media may be, the growing human toll of the civil war and the imminent economic disaster are real. But the West is not worried about Ukraine's destiny: Europe views it as a market, while for the United States it represents a new front against Russia. 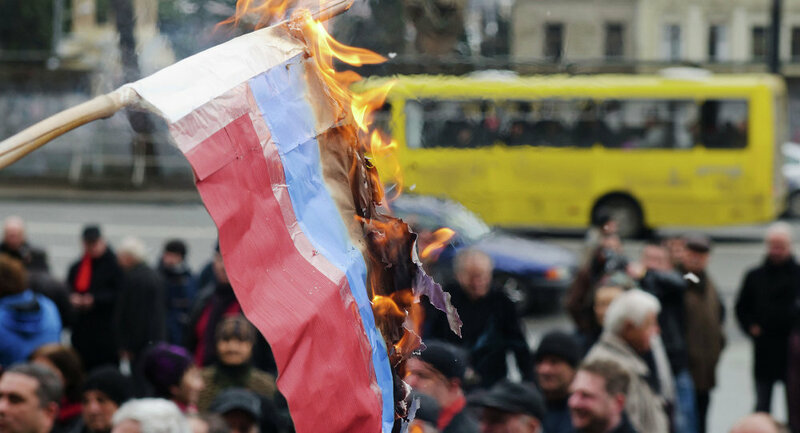 Only Ukrainian society fails to understand this: having accepted the negative identity of the anti-Russian world, Ukraine has ceased being a political, economic or historical entity. Ukraine's historical destiny is predetermined. Now the most urgent issue is whether Russia will survive Ukraine's agony, which will be accompanied by global Western pressure. The threat of a virus of domestic mentality exists in Russia as well. The anti-Russian world's sphere of mentality is not an abstract notion. It is shaping the social environment (primarily among the elite) and institutes that are introducing a negative identity inside the country. The degradation of society continues although it has been somewhat weakened by the inoculation of the Ukrainian events. However, the understanding of the social reality and mechanisms of the modern world arrangement remains low. The immunity to negative and manipulative information influence is sooner instinctive in Russian society. The ideology of Western supremacy and one's own wrongness, second-rate importance and uncivilized character is still shared by a part of active society and is being pumped into the minds of society at the most different levels. Society's critical mentality (especially among the so-called creative class) remains at a very low level, making it an easy target of manipulation, as the White Ribbon Revolution showed in 2011-2012. Social media vividly demonstrate this fact. To counter negative identity it is essential to start interpreting and explaining the West's political language to the public in large. In this language, words have the opposite meanings, not only at the level of propaganda but also at the level of systemic, economic-political, sociological and philosophical knowledge (which threatens the power of the liberal elite). Otherwise, a new devastating blow will be dealt to Russia again, this time from within.